Coo-Var Vandalene Anti-Climb Paint will help to protect your property from intruders with a slippery, sticky non-drying coating. Used on window-ledges, down pipes, brick walls and gutters, it will make a surface virtually un-climbable. The aerosol product is available here. 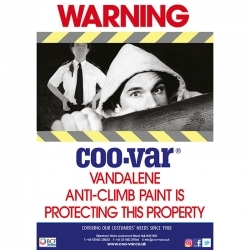 Coo-Var Vandalene Anti-Climb Paint will help to protect your property from intruders with a slippery, sticky non-drying coating. Used on window-ledges, down pipes, brick walls and gutters. In fact, Vandalene makes slippery, anywhere which may be used as a grip point to gain unauthorized access into your building. Coo-Var Anti-climb paint will make a surface virtually un-climbable. Anti-Climb Paint can be used in the fight against copper cable theft, lead theft and many other metals. 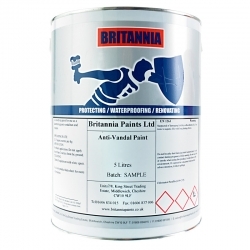 The Anti-Climb Paint contains a hidden identifier, which can be later identified by the police. Coo-Var Vandalene can be used on fences, drain pipes, window ledges, gutters etc to provide a virtually un-climbable surface and burglars will find it impossible to climb and become thoroughly clogged and coated with a greasy "tell tail" deposit of Coo-Var Vandalene. This can then be easily identified on a person running away from the scene of an attempted crime. In addition, the intruder becomes thoroughly marked and can be easily identified by police. Display our A4 and A5 posters as a deterrent to unwanted visitors. We are looking to purchase some anti climb paint for 80m of Palisade fencing how much do you advise we need if applying 10cm to pales tops. This area would equate to 8m² in which case you'd need between 4-8kg of the Coo-Var Vandalene Anti Climb Paint for this. Coo-Var Vandalene Anti Climb Paint will not harm the cat, it’s primarily petroleum jelly. The carpet can be dealt with by hot iron on brown paper to get most of the petroleum jelly out then washing up liquids and water should take out the pigments. The cat, wipe the area with soap and warm water until it’s clean. We offer Coo-Var Vandalene Deterrent Signs. Which Vandalene product is best for a (mostly red) brick wall? Part of the wall is at 45 degrees. Will Vanadalene stick to a brick wall with this angle? Thank you. There is only one Coo-Var Vandalene Anti Climb Paint but it is available in 4 colours and can be applied to vertical or horizontal surfaces so 45 degrees will be fine. Question: if someone with this paint on their hands tries to then wipe it off using my wall (made of timber and brick), how easy will it be for me to clean the mess off said wall? On brickwork relatively easily, on soft wood less so. Can Coo-Var Vandalene Anti Climb Paint be applied to a felt roof without ruining the felt? Need to prevent someone climbing on a flat roof with easy access. Yes, Coo-Var Vandalene Anti Climb Paint is fine on felt. Can Coo-Var Vandalene Anti Climb Paint be used on a plastic coated chain link fence please. Yes, it would last longer if you could clean and lightly abrade the surface to provide a key for the Coo-Var Vandalene Anti Climb Paint to stick to. Coo-Var Vandalene Deterrent Signs are an excellent way to deter potential intruders from attempting to gain access. A thick, non-drying coating for parapets, ledges, down comers, pipes, gutters, window sills, fencing and walls. 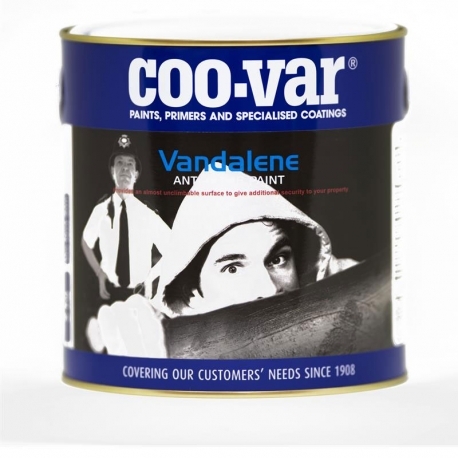 Coo-Var Vandalene Anti-Climb Aerosol (paint version available here) will help to protect your property from intruders with a slippery, sticky non-drying coating. Used on window-ledges, down pipes, brick walls and gutters.